Hurricane Sandy has intensified overnight. Her minimum central pressure is now 943 mb. This will break many low pressure records in NJ and other mid-atlantic states. Maximum sustained winds are 90 mph with gusts to 115 mph. I am truly concerned for the Philadelphia region as we head into tonight. I cannot imagine 90 mph winds from Sandy’s eyewall hitting the region. She is expected to make landfall at around 9-10 PM tonight near Atlantic City. So far, not too many power outages have been reported. This will likely change as the winds increase today and tonight. Check back for more updates today and tonight. Stay safe. According to the National Hurricane Center, Hurricane Sandy is located 280 miles east-southeast of Cape Hatteras and 485 miles south-southeast of New York City. Maximum sustained winds are currently 75 mph with gusts to 90 mph. Minimum central pressure is 950 mb, which normally signifies a category 2 strength storm. Sandy’s hurricane force winds extend out to 175 miles from the center. Tropical force winds extend out to 580 miles from the center. Sandy is expected to continue northeast before taking a turn west toward the Jersey coast. Major storm surge will flood many coastal areas including NYC. Mandatory evacuations are active for the entire NJ coastline. This storm is not like Irene last year. Sandy is coming inland with a much larger wind radius. Stay safe and smart. 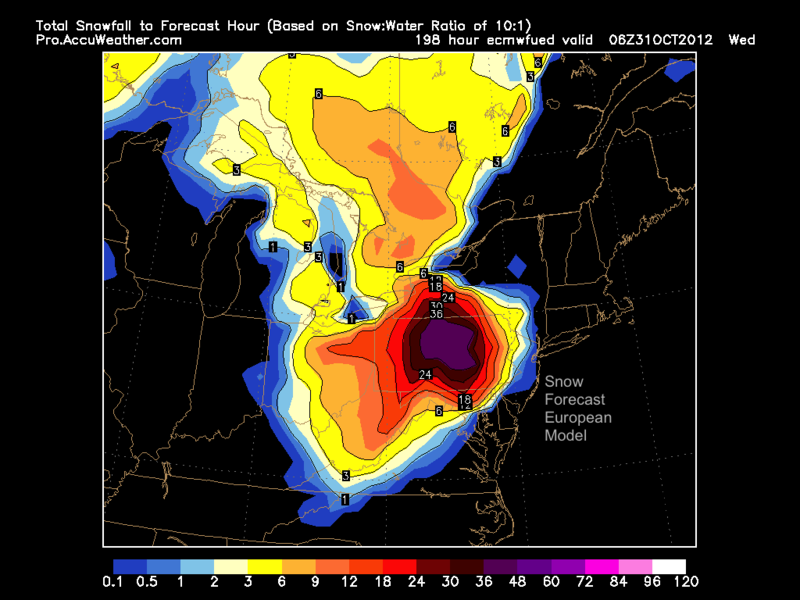 Most models are in consensus that Sandy will retrograde into the East Coast. Right now the uncertainty lies in where she will make landfall. At this point, it could be as far north as Long Island, or as far south as Ocean City, MD. Sandy, even though a weak hurricane is expected to rebuild and strengthen into a strong category 1 storm. She is also expected to become extratropical as she heads into cooler waters off the mid-atlantic coast. First, the GFS. The GFS has been consistently the northern outlier. A few days ago when I posted, I said that the GFS was showing an out to sea solution. But now, however, it has switched to an east coast hit. 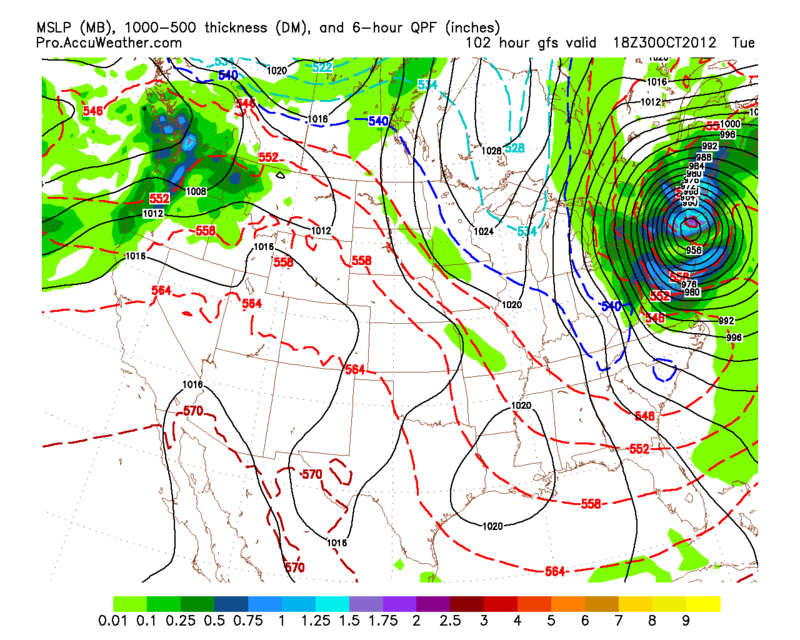 The 12z GFS shows hurricane Sandy taking the turn west a little later than the European. This would take Sandy into Long Island. 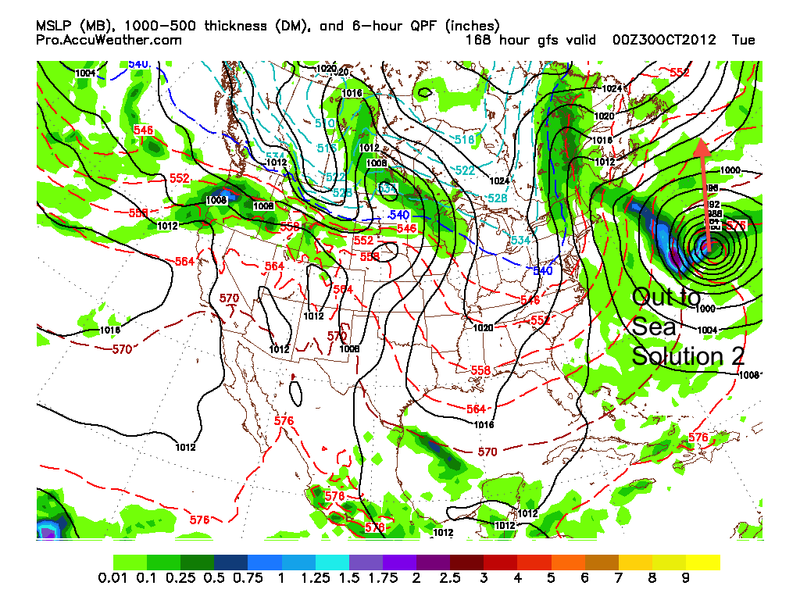 The GFS then brings Sandy south over land, and eventually takes it out over New York state, where it fizzles out. This solution is the outlier out of all the forecast models. I will continue to track the upcoming runs of the GFS, especially as we get closer to the event. 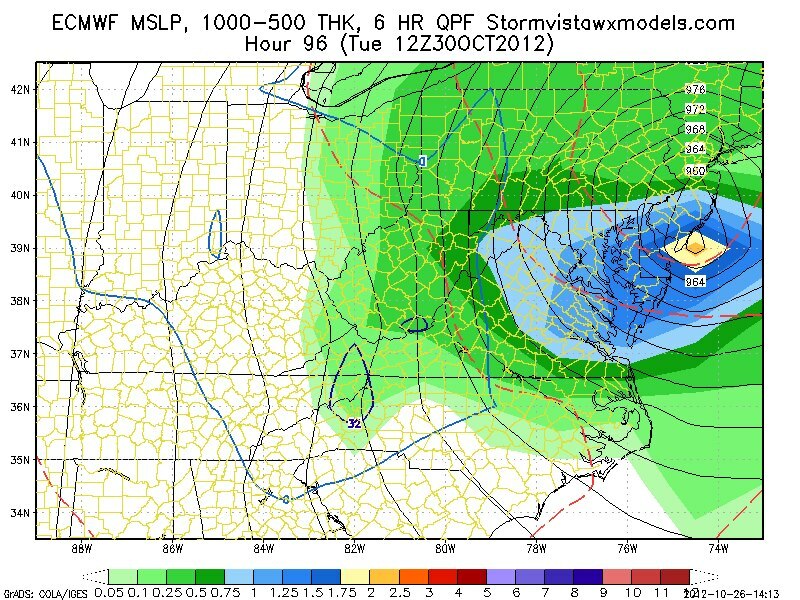 The European model takes more of a south track, turning Sandy to the west much sooner than the GFS. This solution would be devastating to the Philadelphia region, as the proximity to the center and heavy rain will bring many trees down and knock out power for days in places. Rain will start to fall on Sunday evening as we will get some interaction from the phasing cold front and Sandy out in the Atlantic. 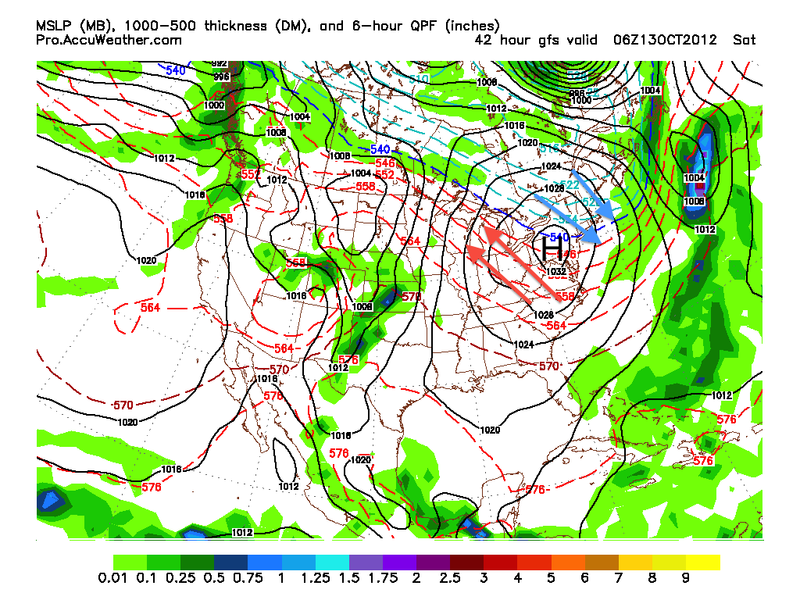 Monday should be a dreary day with drizzle as Sandy heads NE before the retrograde. By Monday late night, the rain should start picking up in intensity. By Tuesday morning into afternoon, the heaviest rain will affect the area.By Wednesday morning, things should start to calm down as Sandy weakens and heads north. 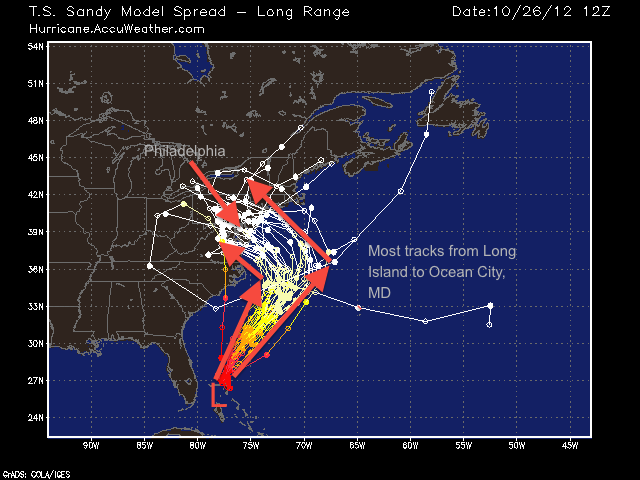 The wind associated with Sandy will depend on the track she takes. The strongest wind field is expected to be southwest of her center. A track that projects Sandy making landfall on the NJ coastline could bring 80 mph wind gusts with 50 mph sustained at the surface. A more northerly track (Long Island) will also bring strong winds. A southerly track , however, will bring lesser wind gusts. The rain forecast for this storm is pretty spectacular. Some models have been projecting 6-10 inches of rain falling in the Philadelphia region. I would not be surprised if some areas surpass this prediction. The effects of this storm will mostly be flooding and wind damage. Because there are many leaves on the ground, many water drainage grates will be blocked, causing widespread flooding. Many tree branches will also snap from the high wind. Some whole trees may even topple. Like Irene last year, there will be widespread power outages. Millions and millions of people will lose power at some point during this storm. Some households may not get it back for days or even a week. Please start preparing now for this storm. Bring any furniture that has the risk of blowing away inside. Stock up on food and drinks; power outages will last for days in places. If you have a generator, make sure it is working correctly. Try not to drive during the storm as branches will be down on many roads. Hi everyone. I am officially going into storm mode on the site. This means I will be updating at least daily on the status of this very large storm coming next Tuesday. This past week I have been tracking a tropical system (now TS Sandy) that has the potential to ride up the Eastern Seaboard and retrograde west into the mid-atlantic, causing widespread damage. Even though we are a week out, there has been an unusual consensus with the forecast models up to this point, which is concerning. Like always, there are two possible scenarios. Most of the models (European, nogaps, canadian, japanese, and UK) have been showing Sandy strengthening into a hurricane, phasing with the approaching cold front, and retrograding westward into the trough. This retrograde would have devestating effects on the Northeast region. 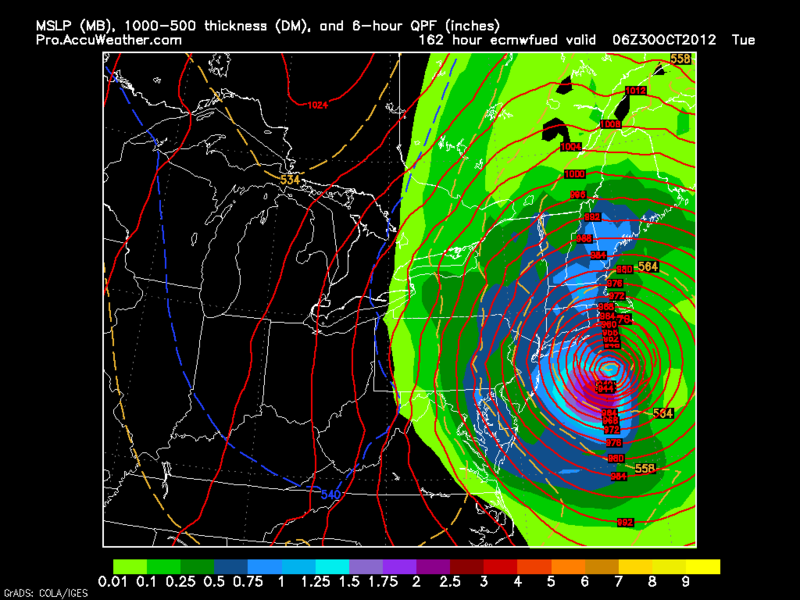 The models are also projecting Sandy having a minimum central pressure of 940 mb, equivalent to a category 3 storm. When Sandy starts to curve back west, she will also bring in cold air from the northwest. Because of her projected strength, this would cause much of the rain to turn to snow in some areas. 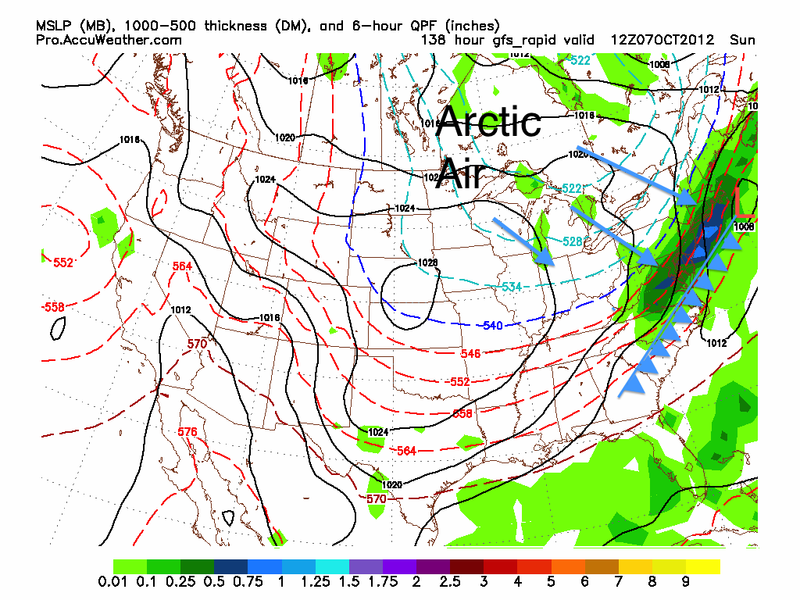 Accumulations could measure in feet in some places as the cold air is rushed in aloft. The storm, of course would also bring heavy rain and near hurricane force winds (much like Irene last year). Rain measurements from a few of the models have measured near 10 inches in places. Obviously, this is just a scenario that the forecast models have been projecting. It may or may not come true. But because it is possible, we have to make the necessary precautions. Either way the storm goes, anyone up and down the eastern seaboard needs to start thinking about preparations for this storm. It’s better to be prepared, even if the storm heads out to sea. Preparations include: making sure you have batteries, food, flashlights etc. As we head closer to next Tuesday, tying down/bringing in any outdoor furniture would be a good idea as well. Yes, we continue to progress to winter. The National Weather Service has posted a Freeze Watch for tomorrow night. The watch includes all counties north and west of Philadelphia. High temperatures on Friday will reach the mid-60s. A clear night sky will induce radiational cooling, dropping low temperatures at or below 32 degrees early Saturday morning. Most computer models are in consensus for this “first freeze.” The NAM and GFS forecast model both show the freezing line creeping all the way to South Jersey early Saturday morning. It shouldn’t stay below freezing for that long as temperatures will escalate near 60 on Saturday. This colder stretch is all in part to a strong high pressure sitting just to our west. Cold air from Quebec is being wrapped around the high and is coming down to the I-95 corridor. Next week, a warm front followed by a weak cold front will pass through on Monday. After a cooler Tuesday, temperatures should slowly increase into the end of next week before a strong cold front arrives next weekend. The week of 22nd will likely have highs consistently in the 50s and lows near freezing. Remember: First freeze is coming tomorrow night… put away any small plants for the night, to be safe. Fall and Winter Patterns are Coming! Yes! Philaburbia is back. Winter, snow, ice, and sleet are coming. It should be a wild and entertaining ride. First on our agenda today are some stats from this summer. It was the 3rd warmest summer on record in the contiguous United States with an average temperature of 74.4 degrees. In the northeast, we had the 10th warmest June-August on record. Considering September was fairly average, I do not expect this rank to change significantly. Precipitation-wise from June-August the northeast received close to the average amount of rain expected. It was the 18 driest June-August overall in the country. Tropics! In May, I predicted 10 named storms this year with 2 landfalls. In actuality, there were 14 named storms, 8 hurricanes, 1 major hurricane, and 3 US landfalls (Beryl, Debbie, and Isaac). My forecast was based on the weak el Niño forming from a fairly weak La Niña in the winter. Since there were only 7-8 years of this pattern in record, I did not have much data to work with. Even though Isaac created massive amounts of damage in the South, no major hurricane hit the Gulf or East coast this year. Hopefully this pattern will continue for as long as possible. A weak low pressure will pass to our south and head out to sea. Some of this moisture from this front will reach our area tomorrow and Wednesday before high pressure sets up in the Southeast. Temperatures should increase by the end of the week (maybe some 80s), before a strong cold front crosses this Saturday Night/Sunday. After the front crosses, expect temperatures to tumble. It will likely be in the 60s next week and could drop into the 50s for highs the week after. It does not look like summer is returning for quite a while.